Futane S.M., Mohite N.R., Nakat J.M. 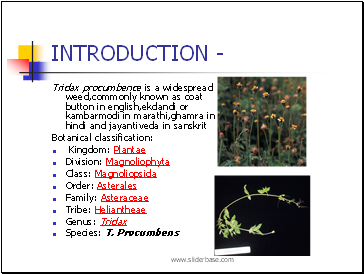 Tridax procumbence is a species of flowering plant in a daisy family.It occurs in tropical as well as subtropical regions,in all the seasons. 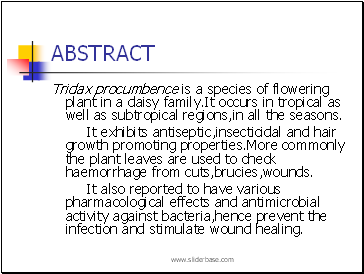 It exhibits antiseptic,insecticidal and hair growth promoting properties.More commonly the plant leaves are used to check haemorrhage from cuts,brucies,wounds. It also reported to have various pharmacological effects and antimicrobial activity against bacteria,hence prevent the infection and stimulate wound healing. 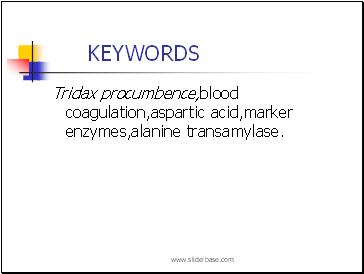 Tridax procumbence,blood coagulation,aspartic acid,marker enzymes,alanine transamylase. 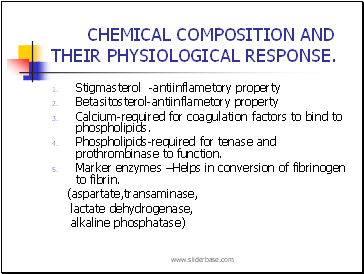 Chemical composition and their physiological response. Calcium-required for coagulation factors to bind to phospholipids. Phospholipids-required for tenase and prothrombinase to function. 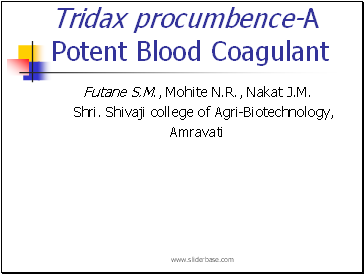 Marker enzymes –Helps in conversion of fibrinogen to fibrin. Blood clotting comes under the concept of haemostasis.It is the major defence mechanism against the blood loss and occurs due to different substances mainly glycoproteins synthesized by the liver. 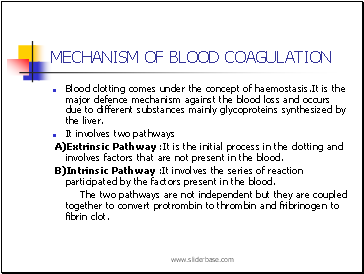 A)Extrinsic Pathway :It is the initial process in the clotting and involves factors that are not present in the blood. B)Intrinsic Pathway :It involves the series of reaction participated by the factors present in the blood. The two pathways are not independent but they are coupled together to convert protrombin to thrombin and fribrinogen to fibrin clot. 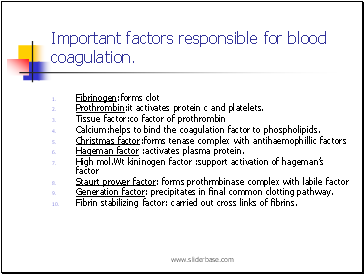 Important factors responsible for blood coagulation.